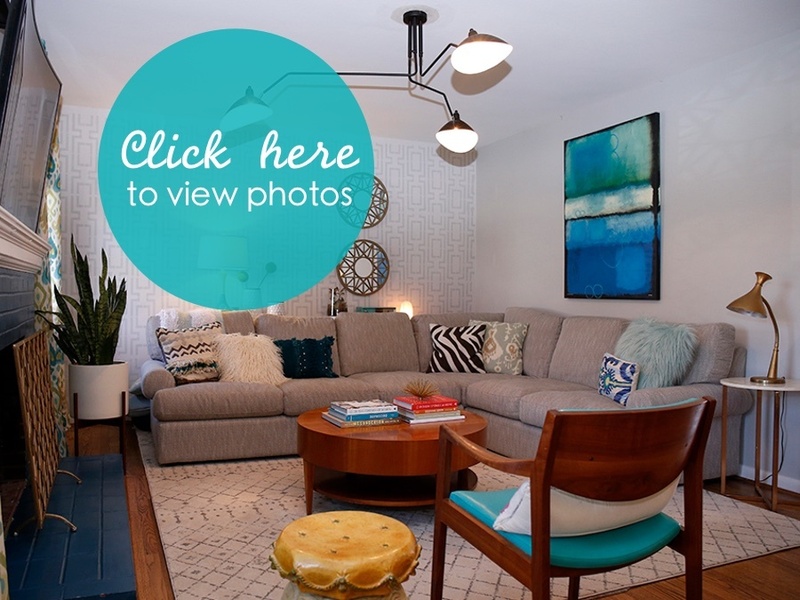 Want to nominate a home to be featured? Please fill out this form. MADEIRA -- When Amanda Strong and her husband, Chris, were expecting their second child, they bought a bigger house. "That's what you're supposed to do, right?" she said. Newish construction, 2,000 square feet plus a finished basement in a pool community where the schools had a good reputation, the house was perfect. "There was just all this stuff. Rooms we never used. Things that were just too precious for the kids," Strong said. So, three years ago, after bringing home their youngest son, Lennox, the Strongs decided to downsize. They settled on a three-bedroom, two-bath mid-century ranch in Madeira. "When we first looked at this place, lots of people were like, 'Really?' We cut our square footage in half," Strong said. "But we asked ourselves, 'Where do we live in our house?' We live in our family room, kitchen, the bedrooms. This is just so much more manageable. I know in two hours I can clean and hit every spot in the house." As others demolish the neighborhood's original houses in favor of larger new construction , the Strongs are leaning into the roots of their small mid-century home. Strong, a graphic designer, always has loved the sleek lines of mid-century modern furniture and has decorated the home with an updated version of the classic style. "I don't want to feel like I'm living in a museum. I don't want to feel like my home is the set of 'Mad Men,' but I want to give a nod to the era," Strong said. When the Strongs moved in, the house still retained its basic outline as a mid-century ranch, but the inside had been updated in a basic modern style -- which was ideal for Strong. "Chris did not want something we had to gut. I really wanted something I could get my hands on and make our own," Strong said. Outside, an aqua front door and a flat deck returned the home's facade to its mid-century minimalism. A turquoise Acapulco chair is a perfect spot to supervise playtime, which sometimes spills over from the driveway to the dead-end cul-de-sac in the quiet neighborhood. Inside, ikat curtains and bamboo shades replaced generic mini-blinds. Period-appropriate reproduction lights illuminated each room as Strong worked her way through the house. Strong painted the kitchen cabinets white, then blue, then back to white. Inspired by Palm Springs and its ubiquitous breezeblock , Strong created a geometric wainscoting in her dining room and wallpapered one side of the room with a pattern of turquoise cacti. (An actual cactus or two sit high on a shelf -- out of reach of small fingers -- in the nearby sunroom.) She scored a mid-century modern china cabinet for free when someone in the neighborhood was clearing out their grandma's house, then brought in plastic "ghost" chairs and a delicate-but-functional reproduction tulip table with a faux marble top to replace the massive dining room set from their old house. "So much of our old furniture was designed for a bigger house," Strong said. Other pieces, things collected from relatives or from vintage stores and websites, fit perfectly into the mid-century ranch. A low dresser that Strong first refinished when her daughter, her oldest child, was born now serves the boys perfectly as a dresser and bedside surface. Even a tortoise-shaped table, gifted years ago from her great aunt, saved for its nostalgic value but formerly relegated to the basement, found a home in the mid-century ranch's living room as the perfect quirky side table. "This feels like the most authentic house because we've been gathering things over the years," Strong said. Not every home-improvement project has been easy. A flood required all new floors, drywall and paint in the finished basement, and when Strong renovated the hall bathroom, she found no amount of stripping would restore the original 1950s-era aqua tile, which a previous owner had painted over. "I get it. Who wants a turquoise bathroom?" Strong said. "Me. I want a turquoise bathroom." She settled for saving the turquoise floor and bringing in a bold black, white and gray geometric pattern to the bath surround. The whole family is involved in decorating decisions, though it's Strong's vision that leads the way. Chris, interested in the adventure of tracking down period pieces, found a vintage radio for the living room and gave Amanda a mid-century steel planter, filled with greenery, for their anniversary. All of the kids have picked out items for their rooms. Strong says the trick to decorating with kids is designing with their needs in mind -- giving the boys extra floor space for the toys that inevitably end up there, loading rooms with baskets and bins to sweep away mess, adding a bedside shelf for her daughter's treasures. It helps, she adds, to take them shopping to places where you know you'll like the things they pick. A trip to Pottery Barn Kids for a jewelry storage solution for her daughter yielded a whimsical metal pinwheel stand that holds earrings and other odds and ends. "We had to get rid of so much stuff when we moved into this house, snd it's been two-and-a-half years of taking things out and cutting down, but it's made me really think about what we need, what I like," Strong said. "Everything in this house, I love. There's nothing in her that I'm just 'meh' about." Eventually, Strong said, they likely will expand the house to add a master suite so that each child has a bedroom. When they do, they plan to retain the home's mid-century design. "This is the first house I've ever lived in that has a history. … This house has a soul," Strong said. "It was built in the post-war period, a time when there was confidence in the economy, and excitement and resurgence, and I feel like if I change that, or take away from that, I'm taking away from the history of the house."